John 12:40 "He hath blinded their eyes, and hardened their heart; that they should not see with their eyes, nor understand with their heart, and be converted , and I should heal them." Brothers and Sisters, have you tried to talk to anyone about what is happening in the world lately? It seems you can engage them on specific points but once you move into the big picture their eyes glaze over and they don't seem to be able to hear you. It's astounding. I've seen it time and time again in the last few months. 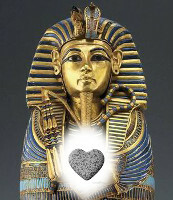 It is a supernatural hardening; they are modern day Pharaohs. (read more).